March 2017 Hiking/Camping More Preparations! 2017-03-11 We did it, not all night but for four hours! With the "help" of the boys earlier in the evening it took about 45 minutes to get all three hammocks up, the under quilts on, the sleeping pads out of their stuff sacks, etc. We all had fun. One observation is that soft shackles are cute and may save a bit of weight and certainly don't bang into things like a light weight carabiner, but for under quilts, they are a bother! It is hard to keep the tension off the shock cord, hold the under quilt off the ground (floor) and connect the soft shackle to the suspension. I'm going looking for some nice smooth light weight carabiners immediately! One setup was the Equip Mosquito Hammock, Snugpak Hammock Under Blanket, Therm-a-Rest Trail Scout sleeping pad and a 5 degree sleeping bag used unzipped as a top quilt. The other setup was the Snugpak Jungle Hammock with integrated Mosquito net, Therm-a-Rest Trail Scout sleeping pad and a 5 degree sleeping bag, again, used unzipped as a top quilt. The third setup, the one I was using was my ENO DoubleNest hammock, DIY Costco down under quilt and the Snugpak Cocoon. I used the DIY under quilt between the bottom of the cocoon and the hammock since I only had two sleeping pads which the boys were using. We were in the hammocks around 10:00pm. Of course the boys had to talk and laugh and mess around for a while but around 10:45 it was all quiet, with both of them breathing steadily and peacefully! I drifted off sometime after that. Around midnight nature called me, so I got up as quietly as possible and made the trip inside. As I was going to sleep earlier I felt that my back was just noticeably cool rather than warm. It was not a distinct feeling but subtle. So before I climbed back in after my nature call, I investigated the down in the DIY under quilt tubes and found that it was fairly sparse in the area below my back and shoulders. So I manipulated and migrated it toward my back area. I was reminded to do that when I recalled a short video by our friend Shug I had seen earlier in the day where he talks specifically about migrating down in your under quilt. The migration made a noticeable difference. After going to the indoor privy and while heading back to the garage, Elijah, our grandson, surprised me at the door. He had to go too! About a half hour after we both got settled back into our hammocks, he called my name and said he was cold. It was then I remembered that I had not closed the valve on the sleeping pad he was using. Sure enough it was flat! He wanted to go inside so I awoke his friend and got them both settled on now-inflated sleeping pads on the floor in the house. That was around 12:30 or so. I decided to head back to the detached garage where it was about 35 degrees even though it was seventeen outside. I had just drifted back to a reasonably comfortable sleep when I heard the side door open and someone step in. It was Elijah. He was somewhere between asleep and awake and said he couldn't get back to sleep. So we went back inside and I set him up in one of our spare bedrooms, in a bed!. By then I was getting a bit worn down myself so I decided to stay inside and finish the night on his abandoned sleeping mat on the floor. The next thing I knew it was just after six am. So after once again dealing with nature I pulled the bedspread back out of the way on our bed, grabbed the Snugpak Hammock Quilt and slept soundly until 7:30! Observations: 1) If you use a self inflating sleeping pad, don't forget to close the valve before bedding down on it! 2) Make sure the down is where you need it to be in a down filled under quilt without baffles lengthwise. 3) Do it all with sixth grade boys. You'll have fun! But wow am I tired tonight! 2017-03-10 Well, I think I have a plan for tonight with the boys. It is about 45 in the garage right now, not bad. I'll have the boys help hang the hammocks, put on the underquilts, etc. I have an under quilt and Therm-a-Rest Trail Scout sleeping pad and a 5 degree sleeping bag for each of them. I plan to use my DIY underquilt inside the Snugpak Cocoon. I also have a DIY top quilt liner made from a Costco Down Throw to use inside the cocoon. There is a chance we'll be warm enough! At least we will find out! Predictions are for it to drop to around ten degrees overnight! So I'm expecting to end up inside some time during the night! Three hammocks strung in the garage for the grandkids overnight! 2017-03-09 Tomorrow evening my wife and I are having our twelve year old grandson and a friend plus our seven year old granddaughter and a friend over for an overnight and trip to the zoo next day. My son did me the favor of telling our grandson that I, our grandson and his friend might be sleeping in hammocks! Thanks Dad! :-) I have to admit that I had thought about it but it is supposed to be pretty cold so had more or less forgotten about it. Then the idea of a garage hang came to me. 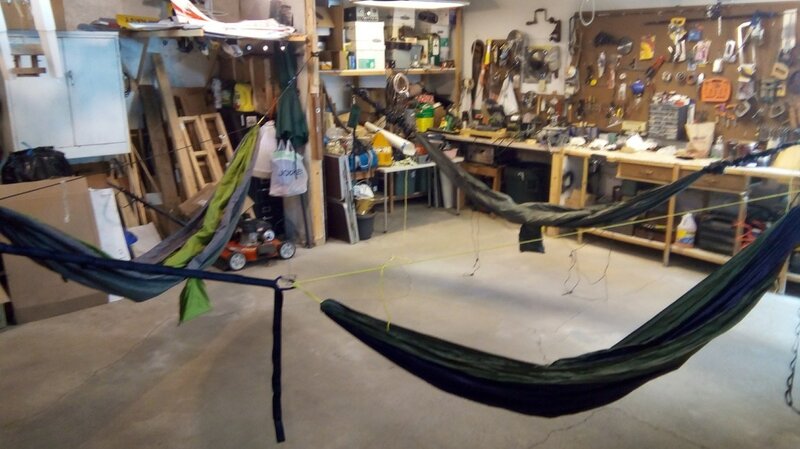 I have a setup for one hammock which I use to try different things without braving the elements. So I began wondering whether I could rig up two more places to suspend hammocks. The picture shows the result. My only concern is whether the garage can handle the stress! Should be fun. Oh yes, the girls will stay inside, probably sleeping in nice soft, warm beds while we tough guys suffer in the semi protected elements! 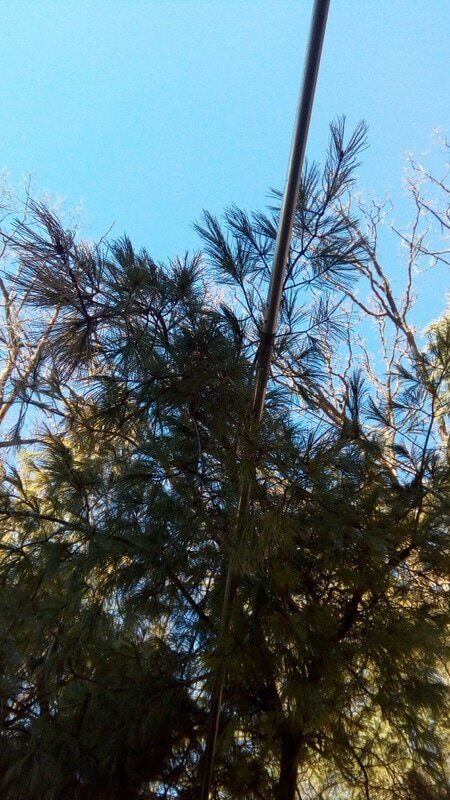 2017-03-03 Even in March, the view from a hammock is spectacular! It is also relaxing. This photo was taken about 2:30 in the afternoon. Temperature was 30 degrees. While lying in my Equip Mosquito Hammock ​on my Therm-a-Rest Trail Scout sleeping pad using a Ozark Trail 40F Climatech Mummy Sleeping Bag as a top quilt to see whether the arrangement would keep me warm, I couldn't resist taking this photo. ​I had just added, with my wife's help, blue foam wings to the sleeping pad to protect my arms from the cold and wanted to try it out while it was relatively cold.I think it will work! Therm-a-rest Trail Scout sleeping pad with the shoulder/arm wings sleeve. This is all in preparation for a backpacking trip to the Porcupine Mountains Wilderness State Park the first weekend in May. On average it is in the 30s at night that time of year. It would be nice to sleep warm those two nights! 2017-03-02 March is continuing to be a month of preparations for me. I continue to experiment with various arrangements to survive colder weather in my hammock. With the trip to the Porcupine Mountains Wilderness State Park in the Upper Peninsula of Michigan now scheduled for May 4-7 I have something specific to work toward. Being right on the shore of Lake Superior and quite early Spring it is likely to be fairly cold overnight. So preparation is essential.